The most unexpected part of being a grown-up is, I regret to say, that multi-tasking is just not what it's cracked up to be. In fact, the pursuit of multi-tasking has become the very bane of my existence. Prior to being a grown-up, I actually looked forward to becoming a multi-tasker of epic proportions. I looked on with admiration when I saw mothers in the supermarket ferrying around four or five children with apparent ease and selecting wholesome foods to put into their trolley while simultaneously making mega business deals on their mobile phone. unleashing a plethora of typos (if anyone knows a collective noun for typos, please let me know) on this blog. Luckily, these are usually picked up within a day or two by my sister. She's convinced that I put them in on purpose to make sure she's reading my blog. poking myself in the eye with the mascara wand on a regular basis (if you have never done this before, not only is it painful, it is also very messy and takes about three quarters of an hour to get your face back to it's pre-mascara-stained state). Oh, and if you know me IRL and have ever wondered why I often go around sporting one blood-shot eye, you now know why. My baby had finally gone down for a nap and I decided to have a blitz on the housework while I had the chance. I filled up the washing machine and quickly got a load of washing on. There were some delicate items to do too which could be done later in the machine, but to save time, I decided to put them in to soak while the other clothes were in the machine so I could hang them all out together. So I ran some water into the trough next to the washing machine and did just that. Then off I went to tackle the mess in the kitchen. "Mum! You need to come here right now!" (he has a habit of doing that and it's become a bit of a case of The Boy Who Cried Wolf). "Don't yell in the house!" I hissed back. "No, seriously mum, you need to come!" he shrieked out again, "There's a flood in the laundry!" I was just about to send him to his room for the rest of the week for yelling while the baby was asleep, when I suddenly remembered that I had indeed put a plug in the laundry trough next to the washing machine and filled the trough with water and that the pipe leading out from the washing machine deposits vasts quantities of water into said trough during its cycle. Oh yes, there was a flood in the laundry alright, and although my son might not yet know how to wash clothes, I can rest assured that at least I have provided him with an unforgettable lesson in how not to wash them. 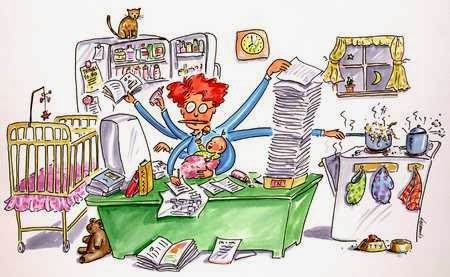 So just in case, like my son, you are not yet a grown-up yourself, please take note: multi-tasking will inevitably turn out to be unexpectedly, and undeniably, overrated. (This was a Finish the Sentence Friday post). How 'bout you? Have you ever flooded the laundry? Ever poked yourself in the eye with a mascara wand? And which side of the fence do you sit on when it comes to multi-tasking?